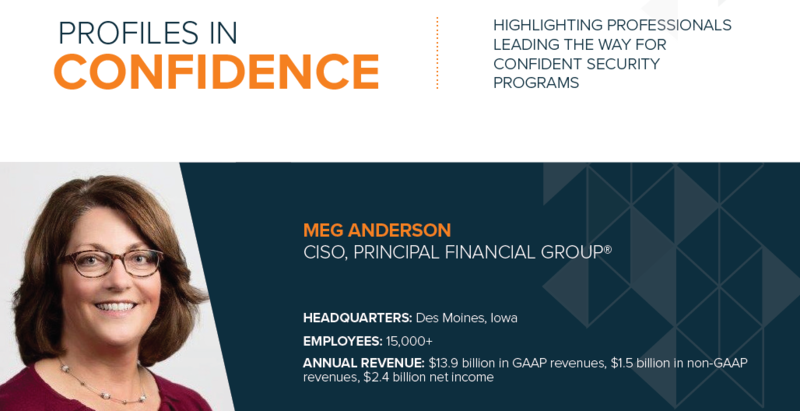 Meg Anderson, CISO at Principal Financial Group®, a global financial investment management and insurance organization, possesses a unique background and exceptional leadership experience. Anderson began working at Principal® in 1987, working her way up the organization while holding a range of IT roles. In these roles, she handled a diverse set of IT issues and strongly built up her business practice experience. Her initial glimpse into information security occurred when certain components of her responsibilities exposed her to a variety of regulatory aspects of privacy and HIPAA, some time before information security became widely prevalent in organizations. In 2008, Anderson was approached about an opening for the CISO role, something she somewhat blindly agreed to, without understanding every facet of what the job entailed. Anderson says, “I had no idea what I was getting myself into. My experience with HIPAA and privacy laws helped me understand some components of security, but I didn’t understand the full breadth of information security at the time. However, having some business unit background allowed me to consider the impact of our evolving security program on our business strategies and to be in a position to use that context as we strengthened the program in the face of increasing external threats.” Throughout her career, she has experienced tremendous growth as a business leader and evolved into a well-versed information security expert. Customer trust is a core component at Principal®, and the information security program holds a prime position to ensure this remains consistent. Anderson states, “Like many companies, we have lots of pressure to make sure we are not the next company in the news. Aside from reputational risk associated with a breach, we operate our business on customer trust by making sure we keep their data and money safe. The amount of investment security receives has increased, which is partially fueled by our digital business strategies. To accomplish this level of alignment and enablement, Anderson says you must understand why the organization is deciding to innovate or create new products and services for the marketplace. She believes once you understand this, it is easier to help those driving innovative initiatives in the organization. In doing so, you can demonstrate how the information security component will ultimately help them get to the end goal quicker, or avoid having to redo any aspects of their project. Anderson explains, “You cannot throw information security policies at someone and walk away. You must understand their business objectives and what they are trying to accomplish. There’s flexibility in collaboration, which leads to quicker achievement of the goals." Anderson uses board discussions as opportunities to educate members quarterly on any relevant news of interest. She explains, “For example, if ransomware is increasing in the news, we help the board understand what it is, what we are doing to protect ourselves ,and give them a level of confidence that we are doing what we should be doing.” She suggests other relevant topics to educate the board on may include identity and access management, the regulatory landscape, threat intelligence, and supply chain risk. Anderson puts a heavy emphasis on building the next generation of leaders. She values recognizing the need to develop successors and prepare cyber leadership for the future within her own company. By doing so, she aspires to make an impact on the upcoming group of information security leadership.